Who is Vee? Where did she come from? And what is the darkness the fae can see inside her? Xander's reaction to these questions drives a bigger wedge between the fae and the Horsemen. His move isn't popular with the others because right now they need fae help more than ever. A bloody message and a series of murders lead to a search for a threat from the past. Instead, the Horsemen encounter something new and dangerous. The race is on to find out what the creatures are and how big a threat they are to an already chaotic world. 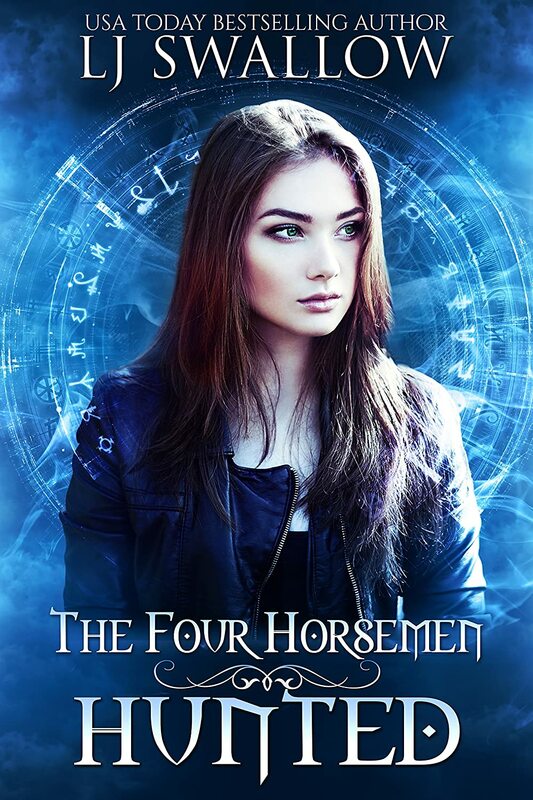 Vee discovers using her powers has a strange effect on her relationship with the Horsemen. Although this pulls her closer to the guys, the conflict between Vee and Xander continues. But is the greatest conflict within himself? And as the Five search for answers, someone watches. What does he know? Can he help? Or does he have an agenda of his own? Hunted takes off with a gruesome surprise left for Vee, Xander, Joss, Heath and Ewan. Another fae is murdered, this time left for the Horsemen to find. Vee and her men are more determined to find out who is doing these murders, but they have no clue where to look. With added pressure from Portia, and mind games to work around, the group must work together to figure this puzzle out. But with attractions building and desires taken to the next level. Is Vee an asset to the team or a problem? L.J. keeps the Horsemen series moving at a fast pace that leaves the reader anxiously awaiting the next. With cliffhangers that set up the next installment beautifully, if not impatiently. Hunted is no exception, I cannot wait to find out what happens next. Vee is trying to find her place and her powers, as well as trying to hang on to human Vee while she can. Her relationship with the guys is growing, and going to the next level with a few. Xander is still growing on me, but we get to see him with Vee more in Hunted and I have to say I am even more of a fan now. I love alpha men and he is definitely that. Heath, Jess and Ewan are their sweet selves, But just because they are sweet doesn’t mean they can’t take out demons. They are the Horsemen after all. Overall I really enjoyed the next installment, and can’t wait for more.